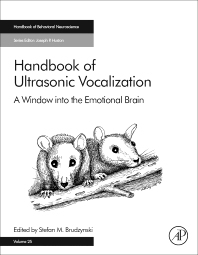 Handbook of Ultrasonic Vocalization: Window into the Mammalian Brain, Volume 25, is an exhaustive resource on ultrasonic vocalizations in vertebrates, providing full coverage of all aspects of these vocalizations. The book also demonstrates the usefulness of ultrasonic vocalizations in studies of animal communication, sociobiological states, and in mammalian models of affective disorders, addictions and neurodevelopmental disorders, making it an indispensable resource for researchers using animal models. The book begins with the evolution of vocal communication before discussing mechanisms of ultrasound production, perception and the brain systems involved in emotional arousal that are responsible for the generation of vocalization and emotional states. In addition, the book covers studies of neuroactive agents and sociopsychological conditions that can regulate the outcome of ultrasonic vocalization and provide clues about animals’ internal states. Critically, the book also includes thorough coverage of pharmacological investigations using ultrasonic vocalizations, increasingly being utilized for studies in affective disorders, psychoses, addiction and alcoholism. No other book provides such extensive coverage of this rapidly growing field of study. Dr. Brudzynski is professor in the Department of Psychology and the Department of Biological Sciences at Brock University, and is a member and former director of the university’s Centre for Neuroscience. He has published more than 70 journal publications on vocalization and the expression of emotionality and was the first researcher to demonstrate ultrasonic vocalization in rats induced by pharmacological methods. He is the editor of Handbook of Mammalian Vocalization, published by Elsevier in 2009, and recipient of numerous accolades, including the prestigious Outstanding Achievement Award bestowed by the International Behavioral Neuroscience Society in 2014.